After "Christmas Crazy" was over and the leftovers have been eaten, most of Christmas has been put away, the house is clean and the laundry is almost caught up...I got to spend some time in my jammies organizing my computer and blog. I first started with organizing my desktop and moved on to cleaning out the starred items in my Google Reader. I moved on to creating a new Facebook page for my blog. pages across the top of my blog. leave me a comment and I will add you. 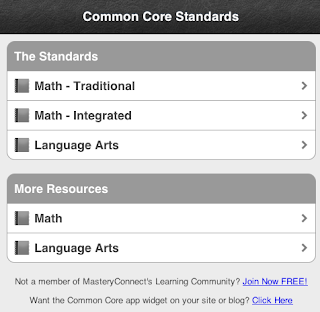 Finally, I cleaned up some code and added this Common Core App to the side of my blog. I have a printout that I have been using, but this is so much more fun. Here's to starting the year a little more organized!! This is great...I should add it to my to do list! That is awesome!! I am a newer blogger and not sure how to get a button?? I also woul like to add blogs that I follow but not sure how to do that either?? I did however figure out how to download that Common Core App!! Exciting!!! Any tips would be greatly appreciated!! I would love to add you as I visit you Blog weekly!! I gave you an award! Come on over and check it out! Hi There! I just came across your blog while searching for info. about rss feeds. I am not sure how to add one to my blog. I have a bloglist that keeps me updated on all the blogs I follow...is that an rss feed? If so, how would I find the address of the rss feed to paste somewhere...? I would love any guidance you could give. If you are using Blogger, I think that there is a RSS feed gadget. I follow blogs using Google Reader.